Some of my favorite childhood memories aren’t just of my dad, they’re of my dad and my brother together. I’m fairly certain that when my brother came into the world, it was God’s way of settling the score with my dad for his years of bad behavior, and I mean that with the utmost love and respect for both my dad and my brother. Without knowing it, when my dad had a son, he essentially became responsible for another version of himself, except one he now had to attempt to discipline. If you’ve been paying attention at all to these stories, you’ll know that my dad was nothing if not strong-willed, too smart for his own good, and stubborn beyond belief. Enter: Mike. Though they only had seven years together, there were a lot of hard fought father-son battles in the Kehoe household, most of which revolved around serious injustices like bedtime or what was being served for dinner – especially if it wasn’t a plain cheeseburger or a peanut-butter-and-jelly sandwich with the crust cut off. These were never physical fights, but more a battle of wits between my dad and his tiny but worthy adversary. More often than not, my dad won. When Mike fought against bedtime, my dad would proclaim, “Eight is late!” Who could argue with that? It even rhymed. My brother’s protest was usually to bawl his eyes out, which tired him out even more, securing an easy victory for my dad. I had seven years on my brother, so I had long since learned to choose my battles more selectively than fighting bedtime. Mike never really caught on to this logic, and instead – like our dad – fought any and every rule or expectation that went against his will. Also like our dad, Mike was willfull to begin with, so this resulted in a lot of fights, and subsequently, a lot of crying. The battle I remember the most, and the one that stands out among my favorite childhood memories of all time, is one where my brother actually triumphed. I was always sort of quietly rooting for our dad in these spats, knowing that if Mike threw a temper tantrum – especially in a public place – then I would come out looking like the golden child for the rest of the day, without any extra effort on my part. But on this particular day, I got a glimpse of how hard it must have been for our dad to parent a child so much like himself, and I developed a newfound respect for my little brother. The general plot of the story went like this: My mom, dad, brother, and I took a wholesome trip to the zoo to soak up some sunshine and spend quality time together as a family. That was the plan anyway, but it derailed around the time we got our tickets and made our way through the turnstiles. So, immediately. As soon as we entered the zoo grounds, my brother, probably three at the time, spotted another little boy riding along cheerily in an upright stroller shaped like a dolphin. As soon as he saw it, Mike had his heart set not on seeing all the live, exotic animals in close proximity to us, but on riding in a plastic one, and being pushed by my parents anywhere he wanted to go. At first, Mike asked politely if he could please ride in the dolphin. 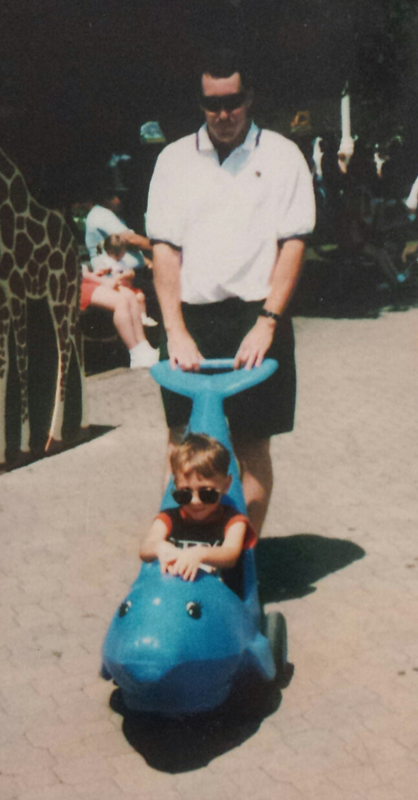 My dad, seeing that the dolphin stroller came with an extra cost – and more likely just not wanting to be seen pushing a giant dolphin stroller around the zoo, a sure sign of the toddler being the one actually driving the situation – firmly said no. That was enough to send my brother into hysterics, in one of the most elaborate public temper tantrums I’ve ever witnessed. I knew this would not end well for Mike, and that I would probably get something extra special from the gift shop for being the well-behaved child that I was. But for some reason, on that particular day, my dad had reached his limit. We always knew my dad had an exceptionally big heart and wanted to give us kids everything he and my mom didn’t have growing up. But I don’t think that was it, at least not this time. I actually think what happened is that our dad saw himself in Mike that day, setting his sights on something he wanted and stopping at nothing to make it happen, no matter how many people he had to annoy or humiliate in the process. And if anyone could respect that strategy, it was our dad. The only thing we have to commemorate this particular family trip to the zoo isn’t something from the gift shop, but a framed photo of my three-year-old brother, his arms crossed and a smug smile on his face, sitting in a dolphin stroller with my dad standing behind him, hands on the fin-shaped handle, ready to push Mike anywhere he wanted to go.